Y-chromosomal DNA (YDNA) is passed from father to son, from son to grandson, from grandson to great-grandson, etc. -- usually unchanged in sequence. However, occasionally a random mutation occurs in the replication process when a son is produced, introducing a change in the YDNA sequence of nucleic-acid bases that this son will, in turn, pass along to his son. Tracking such changes in specific regions ("markers") of the YDNA is the basis of YDNA genealogical analysis. Only males possess the Y-chromosome; therefore, YDNA-based genealogical analysis is uniquely suited for surname studies, since sons generally inherit their fathers' surnames, along with their Y-chromosomes. This is a short primer on how Y-chromosome markers are measured. Much has been greatly simplified – though I hope not overly so. The DNA code is designated by a sequence of nucleic-acid bases. 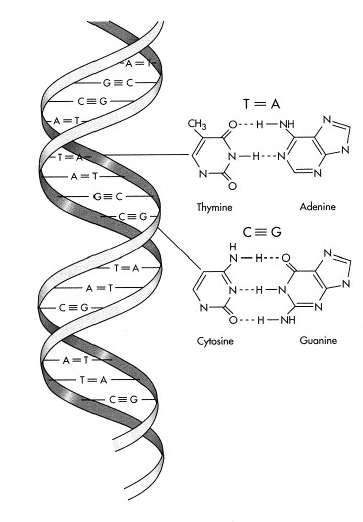 There are only four bases – guanine (G), cytosine (C), adenine (A) and thymine (T). The DNA molecule is actually a double-stranded helix, held together with complementary pairing of bases across the two strands. G bonds only to C; and A bonds only to T.
Markers on the Y chromosome, used to track genealogical lineage, are areas of “junk” DNA that don’t encode for anything functional, but consist of short tandem repeats (STRs) – short sequences of DNA bases repeated a number of times. The number of times the short sequence is repeated at the particular marker site is called its “allele” length. Since these STRs don’t encode for anything important, mutations or changes in their sequence lengths don’t affect survival and are faithfully transmitted to sons thereafter – until the next mutation event causes yet another change in this or some other marker’s allele length. Accumulated changes in allele length of various Y-markers are thus used to track lineage. Here’s an example of a marker that has a STR of the bases “TAG” repeated four times – i.e., an allele length of 4. Thus, if you wanted to, you could have referred to this STR as either a 4-fold repeat of “TAG” or a 4-fold repeat of “ATC” – depending upon which of the two complementary strands you chose to reference. There is a standard convention, but that need not concern us here. Both complementary amplicons are of the same length. With each cycle of the PCR reaction, the number of copies of amplicons is doubled. The PCR reaction is allowed to cyclically repeat – again and again. So, after one cycle there are 2 copies; after two cycles, 4 copies; ..... after 30 cycles there are 2 to the 30th power (or about a billion) copies. The purpose of PCR is to selectively amplify sequences of interest. After so-doing, the reaction product is analyzed by capillary electrophoresis (CE) that allows the length of the amplicon to be determined. Put very simply, CE uses a very fine capillary tube packed with a gel (sort of like a high-tech Jello®) with a high voltage applied across its length. The voltage is applied at a very high magnitude (ca. 3000 volts) for a relatively brief duration (ca. 10 seconds). The DNA amplicon has a charge, and it will therefore migrate down the capillary, attracted by the opposite polarity at the other end. The smaller the amplicon, the faster is migrates – and hence the further it will have migrated down the capillary during the duration of applied voltage. Thus, CE separates amplicons by size. CE is very sensitive and can discriminate between two amplicons that are different in length by only one nucleic-acid base! The primers used in PCR are typically tagged with a molecule that causes them to fluoresce, and that’s how the resulting positions of the amplicons in the capillary are detected in CE. Standards of different amplicon lengths are run to calibrate the CE so that position can be matched precisely to amplicon length. So, suppose Jeff has an allele length of four for this particular marker; and Jim has an allele length of only three for the same marker. This difference will manifest itself as Jeff’s amplicon being three bases longer than Jim’s. Such a difference in allele length is readily detectible with CE. On a Y-marker test, Jeff’s result for this particular marker will be reported as an allele length of “4”, whereas Jim’s result will be “3”. FTDNA performs analyses with panels of from 7 to 13 markers at once. In principle it’s doable at least up to 20 markers simultaneously. Suppose that, instead of using a single primer pair-type, you simultaneously use primer pairs for each of 12 markers. You could run a Y12 test – the full “panel” of markers – all at once. The different primer pairs could be tagged with different fluorescent molecules, to aid in discriminating the different amplicons in the CE assay. Add all 12 primer pairs (appropriately fluorescently tagged); run the PCR through sufficient number of cycles to get detectable concentrations of all amplicons; then assay the PCR product by CE to separate the amplicons and determine the allele length of each marker. An example of a run with 20 simultaneous markers is shown below. From: Butler, J. M. et al., “A novel multiplex for simultaneous amplification of 20 Y chromosome STR markers,” Forensic Science International 129, 10-24 (2002). Where are the places where things can go awry? These four spring to mind: (1) human error in sample attribution (i.e., mis-attributing a sample result to the wrong client); (2) bad primers; (3) contaminated reagents; and (4) inaccurate calibration of CE. I can’t say what steps FTDNA takes to prevent human errors in sample attribution, but I’m confident they have paid attention to that potential problem, too.